The only thing keeping people from getting into your property is a well-maintained fencing system. It gives you, the home owner, peace of mind and control over the security in your home. Not to mention that automatic driveway gates look the part. They encapsulate everything about the West Palm Beach lifestyle; secured living in class and elegance. So, would you like to get your own sliding gates? In our industry, they’re referred to as access control or gate operators and they incorporate anything from a sliding gate, swinging gate, remote access systems, and automatic openers for your entry. Even if you don’t currently have a fencing system or gate that protects your home, we can install a system that meets your needs, protects your home, and adds value to your property. An automatic swinging gate or sliding gate is easy to maintain, easy to install, and doesn’t add any hassle to the homeowner. The remoter openers prevent unwanted access by anybody else, and the system can be programmed to have automatic driveway gates, removing the need to even press a button when entering the property. The look and feel of an automatic gate creates an enviable look for the home. It’s a look of power, or prestige, of status and security. Imagine the feeling of coming home in West Pam Beach, greeted by a pair of swinging gates that soundlessly swing open upon the arrival of the homeowners. It welcomes them to not their home, but their castle, as it closes behind them, barring entry to others. It’s hard to put a value on that sort of emotion and feel. 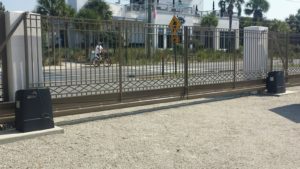 In our 60 years of installing fencing and automatic gate systems in West Palm Beach we’ve worked with modern styles, classic styles, and everything in between. It’s fair to say that there isn’t a gate system that we’ve come across that we can’t automate with a quality access control system. We perform many of access control systems installations each year in West Palm Beach, so we know how quickly your home can go from exposed to secure with a simple automatic gate installation. All you need to be concerned about is the type of installation your home needs. Let’s look at the common choices in homes. This is a common choice for the average residential home. If you already have entry gates, or even if you don’t have anything yet, we can install all the components needed for a sliding gate on your home. The motor smoothly runs the gates along a track that is pre-programmed to open and close on the push of a button. The track, motor, and chains are all secured so that entry is nearly impossible to those who you choose to block. Even in limited spaces, a sliding gate can be a great choice for your home. If the home doesn’t have a gate, this is the first place we’d start with. They don’t require a large arc of free space to swing out, and they can work with the natural barriers at the front of the property for added value. 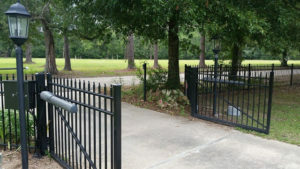 Bushes, trees, and other natural landscaping don’t hinder a sliding gate from opening on the arrival of the homeowner. This is a grand gesture that some of our more distinguished clients really appreciate. Whether you have glass, wood, or wrought-iron gates, the motor swings them open to allow passage at the touch of a button. When closed, they remain secured against any unwanted guests. That feeling of coming home to a set of opening swinging gates really sets the scene for those who consider their home to be their castle. When working with swinging gates, for either single or double-hinged, we work to reinforce the pillars that support the gate, focusing on the hinges. 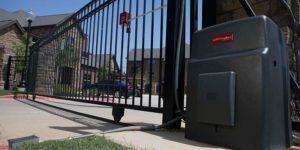 When we’re confident that an automatic swinging gate won’t be at risk of collapsing, we can install a powerful motor on the operation of the gate that swings the gate open soundlessly and efficiently. Space plays a big part in deciding what type of system you should operate. Larger driveways can accommodate a swinging gate, either single or double hinged. If there is a size limit on the gate, a sliding gate will suit better. Regardless of the size, the gates are automated to open either with a remote or an approach. 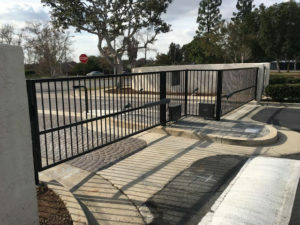 You can even have more than one sliding gate opener or swinging gate opener to pass around the trusted people who are authorized to access the property. Another popular option is to install automatic driveway gates that operate without the need for a button or remote opener. They detect the car’s approach and open the gate to allow just the one vehicle through before closing again securely. It allows the homeowner to never gain forget to shut the gate when they arrive home for the night. Again, it’s a popular option for those who value an added sense of grand gesture to their property. In the world of gate entry systems, we know just what West Palm Beach residents want. Budget Fence and Gate has worked with the residents of this community for over 60 years, meeting and exceeding our customer’s expectations. Most of our work comes from referrals and we value your satisfaction with our craftsmanship. Speak to us today about your options. We know how to combine the powerful look of a formidable front entry gate with an access control system that secures the home. Don’t leave the safety of your home and family in the hands of just anybody. Trust a professional with your automatic gate systems. If you’d like to speak to one of our access control experts, call us today. We have someone standing by to take your call.